International designer Anna Sui's involvement in fashion began at an early age, with a devotion to dressing her dolls and her neighbour's toy soldiers for her own personal version of the Academy Awards. Sui extended her fashion interest to include designing her own clothes and clipping fashion magazine pages to serve as inspirations. To this very day, she continues to refer to these 'genius files'. Called a designer that "never panders" by The New York Times, Anna Sui continues to design and manufacture her signature Anna Sui Collection in her New York City headquarters. Anna Sui founded her fashion empire from a rented half of a floor on 39th Street. By the early 1990s, her high-ranking friends - photographer Steven Meisel, editor Paul Cavaco, hairdresser Garren and make-up artist Francois Nars together with the most popular models of the time Linda Evangelista, Naomi Campbell and Christy Turlington - convinced her to produce a runway show. The move proved to be the making of Anna Sui. The subsequent publicity gained international press and a credible distributor, and from this partnership Anna secured cosmetics and fragrance lines and freestanding boutiques all over the world. Today Anna Sui is a household name in the worlds of fashion and beauty. Her fragrance line in particular is immensely popular, and includes the iconic scents Sui Dreams, Dolly Girl and Secret Wish. 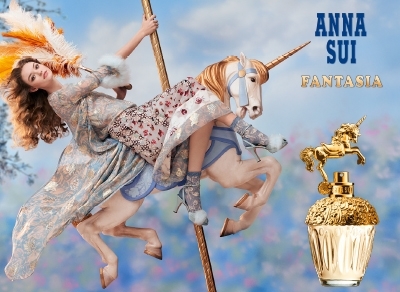 Each fragrance is steeped in the same sense of nostalgia and magical femininity as the Anna Sui fashion line, from the whimsical bottles to the pastel coloured juice.